FOR KIDS MINISTRY IS COMMITTED TO PROVIDING A SAFE, LOVING, CARING AND FUN ENVIRONMENT WHERE CHILDREN PARTICIPATE IN AGE APPROPRIATE WORSHIP AND LEARN BIBLE-BASED LESSONS THAT REINFORCE THE VALUES OF A CHRIST-CENTERED FAMILY. Available Sunday mornings. Our loving and caring volunteers are committed to nurturing your children. The activities in this area include music, playing and reading to your children as well as a Bible lesson and play time. 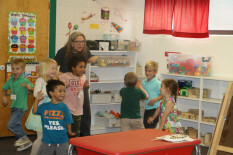 Preschoolers will participate in a group time that includes music, singing and a Bible-based lesson. An activity or craft is also provided to reinforce the lesson. Play time is incorporated to encourage exploration and relationships. Our volunteers are committed to praying for, teaching and loving your children. Elementary age students enjoy a whole group Worship time as well as a small group, age-appropriate Bible lesson and activities that teach about God, how to walk in relationship with Him, and how to love others. We are committed to presenting a Bible-based curriculum that emphasizes God and the wonders He has done.